- “West Of Sunset” are an Westcoast/AOR duo from Sweden remembered for their high quality westcoast sound. The band mainly consists of vocalist, guitarist & keyboardist Björn Strom and bassist & guitarist Thomas Axelsson. The group was founded under the name of FINGERPRINTS in 1989. After the release of the album “Time Is All We Need”, singer, guitarist and keyboard player BJÖRN STROM and guitarist / bass player THOMAS AXEL founded a successful duo. Björn Strom’s unique voice made the 1992 album “West Of Sunset” one of the most successful records of this genre. 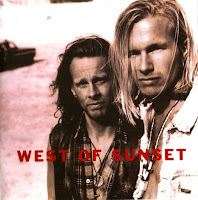 - West Of Sunset are an AOR/ Westcoast duo from Sweden. The band mainly consists of vocalist, guitarist & keyboardist Björn Strom and bassist & guitarist Thomas Axelsson. Sound-wise, the guys on “West Of Sunset” though orientate more on the American West Coast sound and not on the Swedish AOR traditions. - An unlikely Swedish duo who manage to release a credible set of tunes on their debut album. 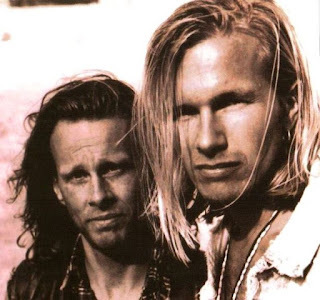 Originally coming together a few years earlier under the monicker Fingerprintz, the pair put on a strong showing of earthy melodic rock, drawing upon influences such as Michael Learns To Rock. The sound is very mid-west oriented, with a few modern pop drawstrings in there for good measure. 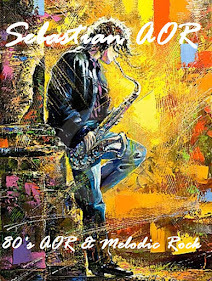 It's not smooth Swedish 'playing AOR by numbers' at all, but more syncopated and stripped back. The opening trio of songs are all pretty special. 'Giving My Heart Away' is very upbeat, while the title track 'West Of Sunset' is a real melter, bedevilled with a sublime chorus and vivid verses leading into it. 'Ocean Boulevard' is another upbeat pop masterpiece. On this one Mr Strom sounds like Jeff Scott Soto doing pop!! 'Now You've Gone' is a subtle ballad which drifts on an ocean of emotion. Again the choruses are killer! The duo manage to crank up the guitars on 'Gimme Your Love' while the organs and drums keep pace and volume. The pop smarts return on 'Time Is All We Need' while the sound effects are let out of the bag on 'Gotta Have It All'. 'Homeward Bound' moves similarly to the opener 'Giving My Heart Away', echoes of the mid-west surge forth on 'Taking A Chance' before ending with the ballad 'Before I Trust'.